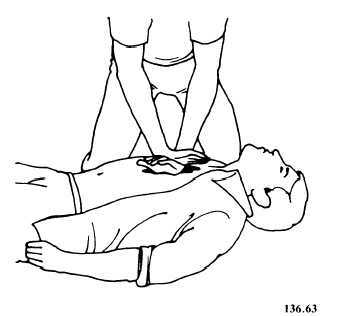 CHEST THRUST RECLINING TECHNIQUE. Kneel at either side, and place your hands on the chest in exactly the same manner as for external chest compression (fig. 4-9). Give four quick downward thrusts with the arms. If unsuccessful, repeat the four chest thrusts until the obstruction is dislodged. Figure 4-9.Position for reclining chest thrust. The second aspect of basic life support is to restore breathing in cases of respiratory arrest. Failure of the breathing mechanism maybe caused by various factors. They include complete airway obstruction, insufficient oxygen in the air, the inability of the blood to carry oxygen (carbon monoxide poisoning), paralysis of the breathing center of the brain, and external compression of the body. Breathing failure is usually, but not always, immediately accompanied by cardiac arrest. Periodic checks of the carotid pulse must be made, and you must be prepared to start cardiopulmonary resuscitation (CPR). The signs of respiratory arrest are an absence of respiratory effort, a lack of detectable air movement through the nose or mouth, unconsciousness, and a cyanotic discoloration of the lips and nail beds. The purpose of artificial ventilation is to provide a method of air exchange until natural breathing is re-established. Artificial ventilation should be given only when natural breathing has been suspended; it must not be given to a person who is breathing naturally. Do not assume that a persons breathing has stopped merely because the person is unconscious or has been rescued from water, from poisonous gas, or from contact with an electric wire. Remember: DO NOT GIVE ARTIFICIAL VENTILATION TO A PERSON WHO IS BREATHING NATURALLY. 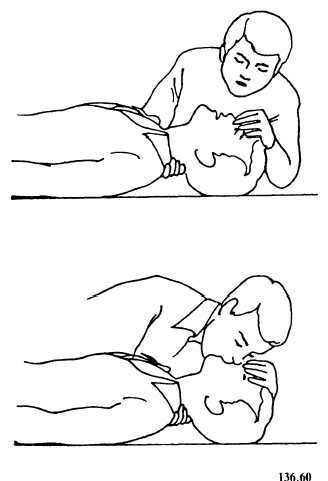 If the victim does not begin spontaneous breathing after using the head tilt or jaw thrust techniques to open the airway, attempt to use artificial ventilation immediately. If ventilation is inadequate, use the thrust techniques to clear the airway, followed by another attempt at artificial ventilation.